Make your app look unique and promote your sponsors with the help of Splash Screens. Please note that this is only for branded apps and is not available in the Attendify Container App. You can learn more on the differences between the two apps here. A splash screen is an image that is shown while your branded app is loading. A splash screen is a great way to give your app a look that’s unique. Please note that splash screens are not a part of the Attendify container apps and is only used for branded apps. How do I create a splash screen? You can create a splash screen in any image editing program, or ask your graphic designer to create one for you. Typically you’ll want to include a logo and any important information users need to know about your application. For example, the date and location of your conference/expo/event can appear on your splash screen. What size should the splash screen be? The splash screen should be at least 640x960 to fit iPhone 4S, 750x1334 to fit iPhone 6-7 and 1125x2436 to fit an iPhone X. The graphics file should be saved as a PNG or JPG and uploaded on Step 3 (Settings) of the app building process. 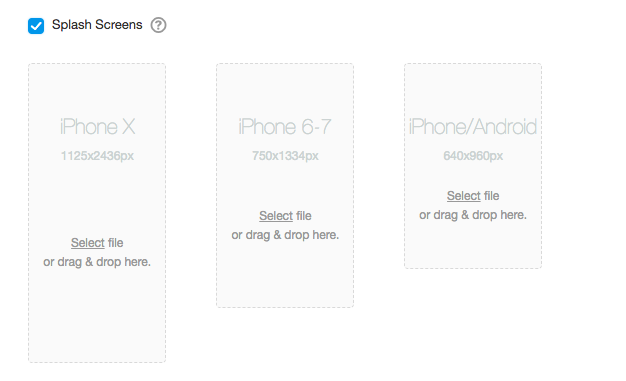 Attendify will automatically resize your splash screen to fit different phones and devices.